In this episode of Science ka Adda, we discuss the recent results from Curiosity rover suggesting the presence of liquid water on Mars. In fact, conditions on Mars - four billion years ago - may have been more suitable for the origins of life than even the Earth. If so, then life may have originated on Mars and may have seeded the Earth. If that is the case, then may be we are all ultimately Martians! This episode features original musical composition by Umer Piracha dedicated to Curiosity rover. For more SkA, visit www.sciencekaadda.com and for more detailed discussions on astronomy in Urdu, please visit Hamari Kainaat at hamarikainaat.com. SkA: Water and the Search for Life on Mars (Urdu) from Science ka Adda on Vimeo. Our next Science & Religion lecture at Hampshire College is this coming Thursday, February 26th. 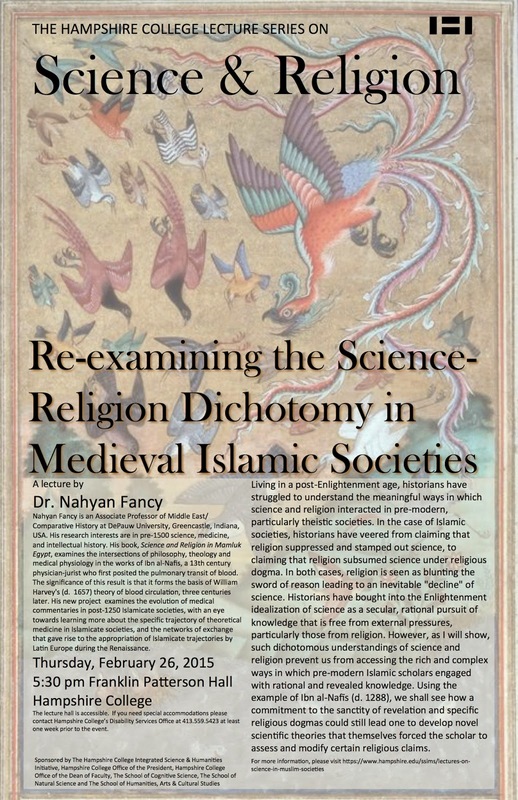 Our speaker is Dr. Nahyan Fancy and he will be talking about science in medieval Islamic societies. Back in 2013, I had highlighted his fascinating book on Ibn-Nafis' work on pulmonary transit of blood. We are excited to have him here and if you are in the area, join us for the talk. Living in a post-Enlightenment age, historians have struggled to understand the meaningful ways in which science and religion interacted in pre-modern, particularly theistic societies. In the case of Islamic societies, historians have veered from claiming that religion suppressed and stamped out science, to claiming that religion subsumed science under religious dogma. In both cases, religion is seen as blunting the sword of reason leading to an inevitable "decline" of science. Historians have bought into the Enlightenment idealization of science as a secular, rational pursuit of knowledge that is free from external pressures, particularly those from religion. However, as I will show, such dichotomous understandings of science and religion prevent us from accessing the rich and complex ways in which pre-modern Islamic scholars engaged with rational and revealed knowledge. Using the example of Ibn al-Nafīs (d. 1288), we shall see how a commitment to the sanctity of revelation and specific religious dogmas could still lead one to develop novel scientific theories that themselves forced the scholar to assess and modify certain religious claims. intellectual history. His book, Science and Religion in Mamluk Egypt, examines the intersections of philosophy, theology and medical physiology in the works of Ibn al-Nafis, a 13th century physician-jurist who first posited the pulmonary transit of blood. The significance of this result is that it forms the basis of William Harvey's (d. 1657) theory of blood circulation, three centuries later. 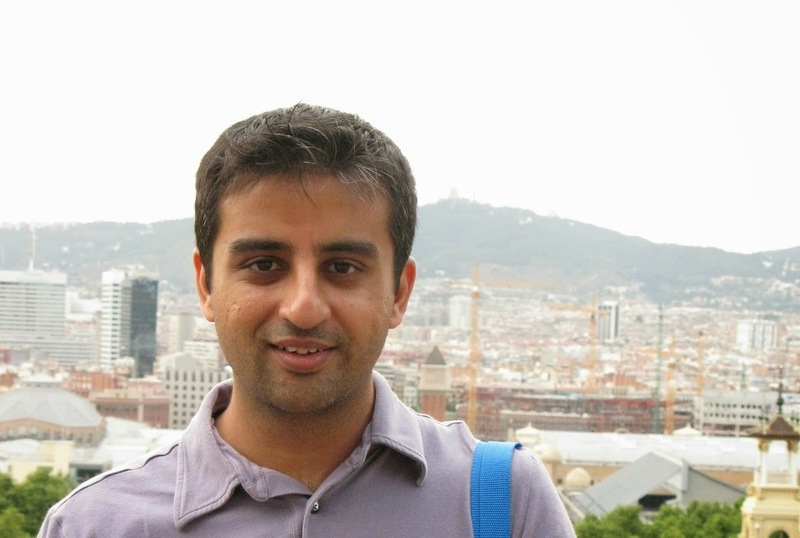 His new project examines the evolution of medical commentaries in post-1250 Islamicate societies, with an eye towards learning more about the specific trajectory of theoretical medicine in Islamicate societies, and the networks of exchange that gave rise to the appropriation of Islamicate trajectories by Latin Europe during the Renaissance. Here is a wonderful 7-minute animation on the life of Alfred Wegener and his idea of continental drift that transformed 20th century geology. Enjoy! Reginald Foulds is ready to go on a one-way trip to Mars. His dream may be a step closer as he is amongst the final 100 candidates chosen by Mars One, a private organization that is planning on sending humans to Mars by 2025. This is impressive. Initial applications for this Mars trip numbered close to two hundred-thousand. He is now the only Pakistani left in the pool. A retired helicopter pilot of Pakistan Air Force, Foulds has a 1 in 4 chance of being picked for the ambitious first human settlement on the Red planet. If selected, he will be pushing 70 by the time of the first proposed Mars One mission. At this time we do not know if Mars One will even be successful in getting everything ready for a human mission to Mars. Nevertheless, this project has generated considerable amount of public interest in Mars exploration as well as some criticism. One of the most common criticisms deals with the one-way aspect of the mission. Many call it a suicidal mission as there are no plans to bring astronauts back to Earth. In fact, it is this very one-way nature that makes the mission affordable in the near future. But I would not call this "suicidal". The plan is to have twenty-four individuals initiate a permanent human presence on Mars. Cargo vessels are expected to deliver habitats suitable for Martian living well before the first human mission leaves the Earth. The goal of going to Mars is not to die - but to live! Such an adventure is not for everyone. But there have always been explores amongst humans and it is probably because of such early adventurers that some of our ancestors left Africa and eventually established presence in almost every corner of the Earth. People like Reginald are just extending this tradition to a neighboring planet. Others in the future will take our descendants to outer planets and may be even to other stars. 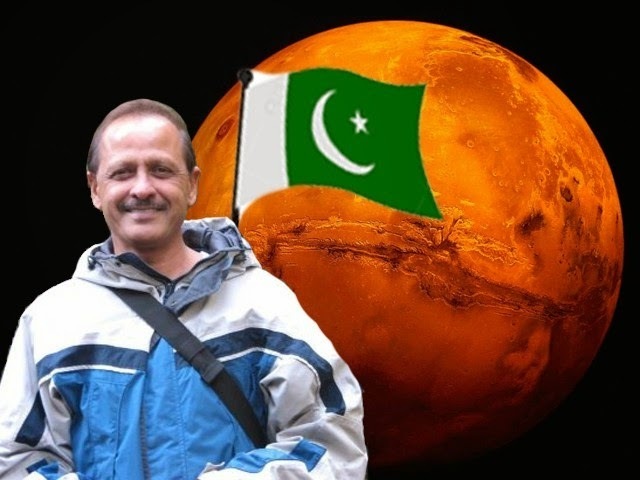 What will be the impact on Pakistan's space program if Reginald Foulds is selected amongst the astronauts headed for Mars? On the face of it, nothing much. Mars One is a Dutch organization that plans on using primarily American aerospace companies to achieve its goals. The funds for the project are being collected through sponsorships with a promise to deliver - if it at all happens - the most watched reality show ever. As a scientist, the last sentence is as disheartening as it can get. However, there are intangibles that can help science in Pakistan. Reginald's selection in the final batch of astronauts will certainly boost interest amongst school children in Pakistan. Even without Reginald, I can imagine a spike in interest about Mars, solar system, astronomy, and science, in general. How can it not? But the presence of a Pakistani astronaut on Mars can make that endeavor that much more personally identifiable. But there is another aspect as well. There are 35 countries represented between the 100 candidates shortlisted for the Mars mission. The reality-show aspect aside, this is a stunning diversity for the case of exploration. Several of our neighbors are represented: India has three candidates and both Iran and China have two. It is almost a certainty that the final 24 candidates will be from several different countries, ethnicities, and religions. A successful permanent presence on Mars will necessitate overcoming prejudices that divide us here on Earth. This is the good side of humanity and Reginald's presence - if he is selected - will allow us to indirectly experience it as well. May descendants of the first batch of astronauts on Mars may create their own identity as 'Martians' and may develop a prejudice against humans on Earth. All said, it is exciting to have a Pakistani represented in the shortlist of candidates for Mars. I hope he is among the astronauts that experience red sunsets and sunrises on Mars. Echoing Carl Sagan's message to future Martian explorers: "I wish I could be there with you". Archaeological fieldwork in Libya is at a standstill. Four years after the Arab Spring and the February 2011 Libyan revolution that ended the regime of Muammar Gaddafi, violence remains rife. Recent escalations in fighting have injured and killed people and damaged the nation's cultural heritage, infrastructure and free press. Libyan monuments have been seriously damaged, including the Karamanli mosque, built in 1738 in the capital, Tripoli, and Islamic tombs that date to between the tenth and twelfth centuries at Zuwila, near the west-central town of Murzuq. 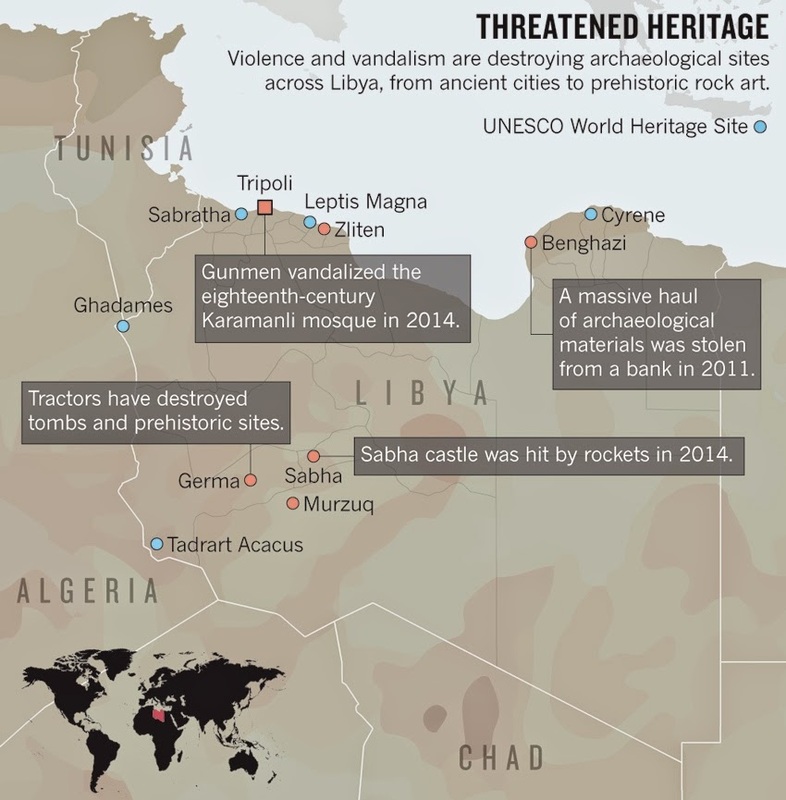 This, along with concerns about the illicit trafficking of cultural materials, led Irina Bokova, the director-general of the United Nations Educational, Scientific and Cultural Organization (UNESCO), to call for greater protection of Libyan cultural heritage in November last year. I have worked in Libya since 1990. My last field trip to the Messak plateau in the southwest ended abruptly in February 2011 with an emergency evacuation on a military aircraft. Before the revolution, I spent three months each year in the desert studying the prehistory of the Messak and nearby Tadrart Acacus mountains, which lie close to the border with Algeria, famous for their 9,000-year-old rock art. Since then, scientific and cultural relations between Libya and the international community have stagnated. Archaeological tourism — a major source of revenue and jobs for locals such as the Tuareg and Tebu people, the two major Saharan ethnic groups in Libya — has stopped. Perhaps the greatest threat to Libya's diverse heritage is the trafficking of archaeological materials, for profit or to fund radical groups. This has already been documented in Syria and Iraq7. No one has been able to fully assess the situation in Libya. Going to work among the black smoke of grenades, the men and women of the Libyan Department of Antiquities are doing their best. But museums are closed and the little activity left in the field is limited to the north. Fieldwork is vital to research and central to fundraising in archaeology. But in Libya — and other violence-wracked countries — archaeology as we have practised it has come to an end. Lengthy excavation campaigns will be impossible for years, if not generations. Researchers must imagine a different future based on other methods. International funding and attention must return to scientific studies of Libyan heritage. Research should focus on existing materials in museums and collections. Granting bodies should give greater priority to research that can be carried out on computers or in the laboratory. Sample analyses of archaeological materials can be done in international labs, where Libyan scientists should work and be trained. Building an online library of rock-art sites, with the involvement of Libyan students and colleagues from other countries, would help Libyan scientists to overcome their isolation and regain a sense of identity. Museum collections that span from remote prehistory to the Islamic cultures should be digitized and made freely available to a global audience. Unpublished collections held by international teams should also be digitized and shared online. Remote analyses of satellite imagery, for example, has been used to reveal lost Saharan cities (see go.nature.com/8y1gxh). International cooperation between local and foreign groups working in Libya must be supported. 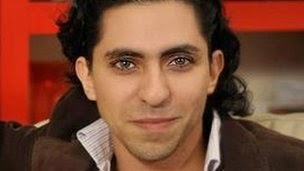 Travel funding and visas for Libyan scientists to work temporarily overseas should be found. 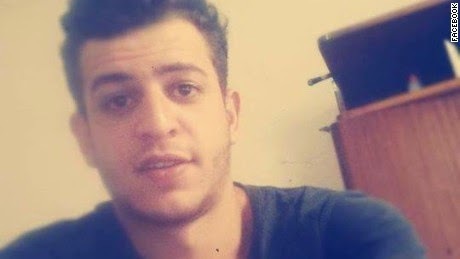 And mobility programmes for scientists such as the European Union's Erasmus Mundus should be exploited — Libya's application numbers have been historically low. Energy companies and others with commercial interests in Libya should be encouraged to work with local stakeholders to help to train local personnel in scientific research. Without these steps, archaeological research in Libya, already moribund, will soon die. It would be gravely disappointing and paradoxical if after years of neglect under the Gaddafi regime Libyan archaeological heritage is once again be abandoned. As well as a failure of the 2011 revolution, it would be a missed opportunity for a generation of young Libyan archaeologists — and a tragedy for the safeguarding of monuments and sites of universal and outstanding value. Here is a link to the full article but you will need a subscription to read it. Second Episode of SkA: The reality of Blackholes as shown in the movie "Interstellar"
SkA: The reality of blackholes as shown in the movie "Interstellar" (Urdu) from Science ka Adda on Vimeo. SSiMS talk tomorrow: Explorations of Web 2.0: What's Video Got to Do with the Study of Science and Muslims? Explorations of Web 2.0: What's Video Got to Do with the Study of Science and Muslims? Abstract: We will be presenting preliminary results from our ongoing Islam and Science Video Portal project. We will discuss what we have learned thus far about videos addressing Islam and the natural sciences: what are they, where are they, who's making them. But perhaps, even at a more basic level, what is a video on "Islam and science" and who would be crazy enough to try to catalogue the Internet? Come learn what happens when you put together an astronomer and a medieval Islamic historian, both of whom are fascinated with new media and constructions of identity and are unafraid to dive off the bleeding edge of the study of Muslims and internet videos. Vika Gardner: Dr. Vika Gardner is the Research Fellow for the Science and Islam grant at Hampshire College. She has taught courses on various aspects of Islam, Gender and Sexuality in the Islamic World, and Iranian cinema at several small liberal arts colleges, including Mount Holyoke College. 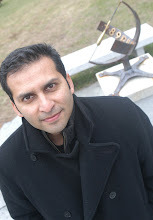 Salman Hameed: Salman Hameed is Associate Professor of Integrated Science and Humanities in the School of Cognitive Science, and heads the Center for the Study of Science in Muslim Societies (SSiMS) at Hampshire College. His research work focuses on understanding the reception of modern science in contemporary Muslim world. He teaches interdisciplinary courses including Biological Evolution in the Public Sphere; Science in the Islamic World, and Aliens: Close Encounters of a Multidisciplinary Kind. This semester he is teaching Evolution, Islam and Modernity, and Creating Science Fiction Short Films Using Real Science (with Jason Tor).